17TRACK is one of the most popular services in today's e-commerce industry. It is used by merchants who are dealing with online business and millions of online shoppers from all over the world. It supports to track packages of more than 500 carriers for ePacket, EMS, postal registered mail, even flat-rate surface mail, as well as the world's major express services such as DHL, Fedex and many more. Basically, you can use it for tracking anything you purchased online. The following are some instructions for our new users. Click "Register" > Enter your email ID> Verify your email address> Set a password > Complete Registration. If you have signed up an account successfully, you can log in your account by clicking "Login" > Enter your email ID and Password > Complete Login. Alternatively, you can use a third-party quick-login method: Enter the third-party account password to complete the authorization, then link your email account with 17TRACK, and log in your account after the verification is completed. For future login, you can directly login via your third-party account. Currently, we have three types of membership plan, which are, free member, standard member and premium member. 17TRACK gives away 40 tracking quota generously for free member at present. If you are having an excessive amount of orders, you can choose to use our paid service by clicking on "Purchase now". Once you are a paid user, you will find more timely updates and up to 200 tracking quota. We are working on more exclusive features for paid users. Notice：The membership plan is only available for android system currently. If you are using iOS system, please take your time to login your account here: buyer.17track.net via a desktop device. 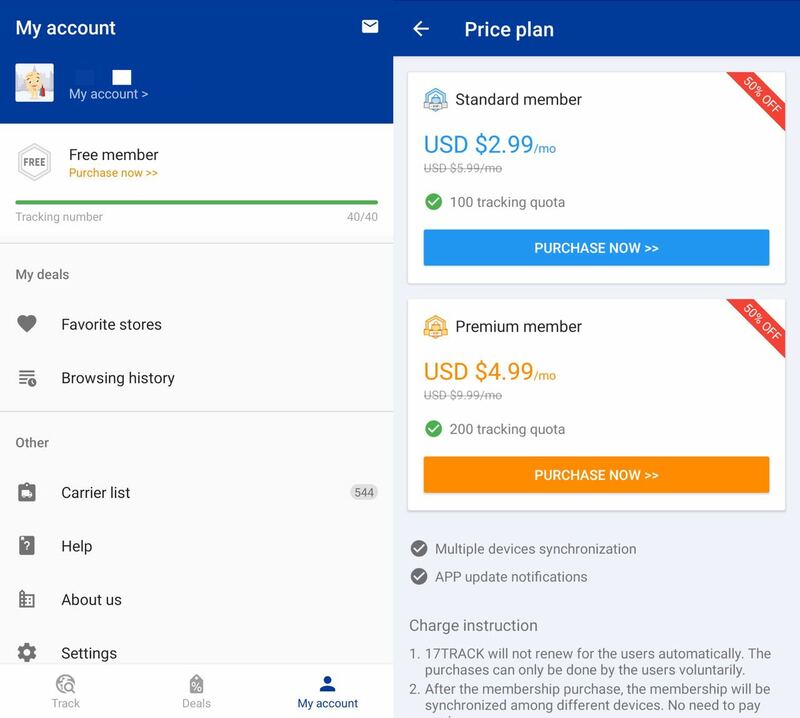 When you complete the purchase of the membership, you can login your iOS device, the membership of your account will be upgraded in no time. 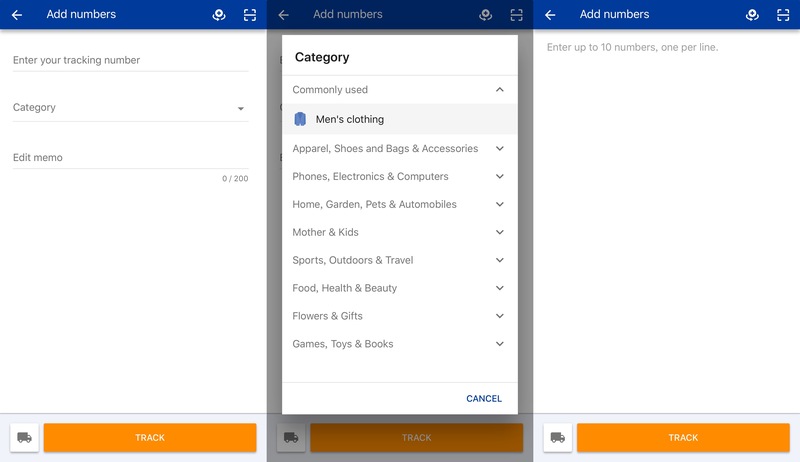 Currently, the app supports two modes of adding numbers, which are: add a single number and add multiple numbers at once. 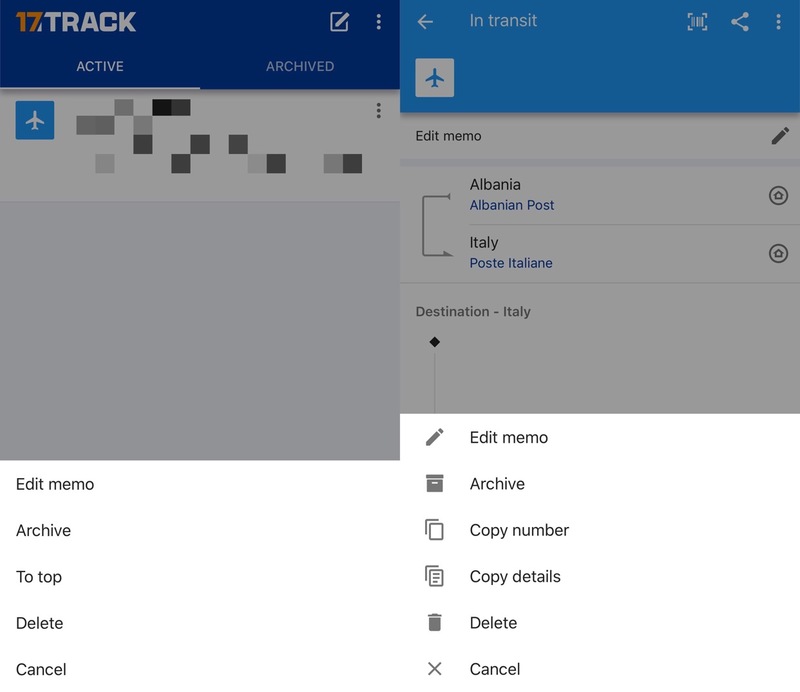 Add a single number：While adding one single number, you can select a category and edit memo for the number. In case you have multiple packages in the active list, this is the best way to remember which is what. In addition, the app has embedded a scanner for you to scan your QR code or barcode. Add multiple numbers：When you have several numbers that need to be added at the same time, you can switch to multiple adding modes. When these numbers are successfully added, they will be shown in your tracking list where you can click every single one of them to view tracking information and edit memo or select categories for them. Here are some commonly used actions: Edit memo, copy, delete, archive, reactivate, etc. Edit memo：This is one of the most frequently used and practical actions. It helps you to remember what's contained in that package. Copy number：Click to copy number or copy tracking details. Delete：For received packages, or packages that don't need to be tracked anymore, you can delete them. Please proceed with caution because deleted data are irreversible. Archive：For received packages, or packages that don't need to be tracked anymore，you can also archive them. Please be noted that archived packages won't be tracked anymore. Reactivate：For archived packages, you can reactivate them to the active tracking queue. This is an exciting new feature. 17TRACK selects hundreds of Chinese merchants and as well as many world famous brands. The deals page displays their best promotions, products from over 500 stores across more than 100 categories for global buyers. Click “My account”, you will see all related information of your account as well as the “Settings” option. My account：Where you can set your nickname, country, password, or link your social accounts for quick-login and you can also change your registered email ID. 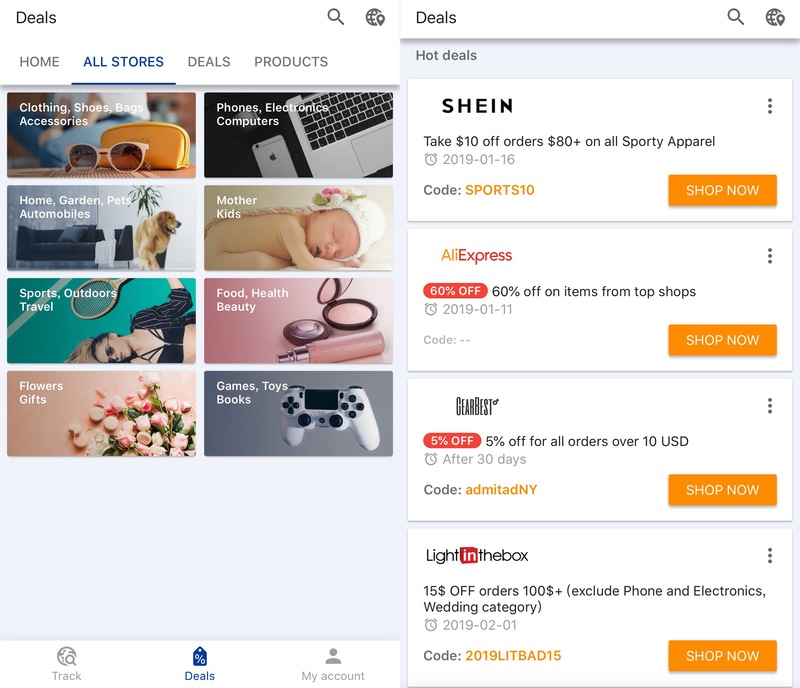 My deals：Here you can find stores that you have Favorited before and see your browsing history records of the deals page. Help：Click here you will be redirected to our help center to see some commonly asked questions and answers. 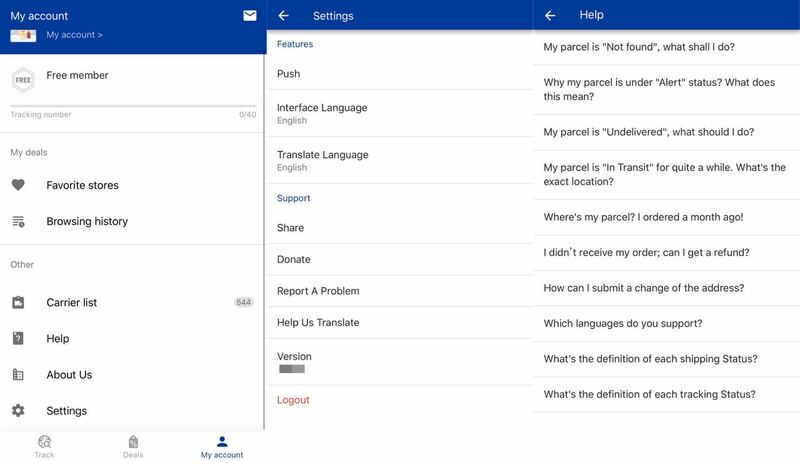 Settings：Here you can set up all your preferences such as turning on the notification function, setting app interface language and selecting target language to translate the tracking results. Donate：On this page you can donate to support our further development and keep this service up ... We are constantly improving our service, so it would be awesome if you support us with a small donation. 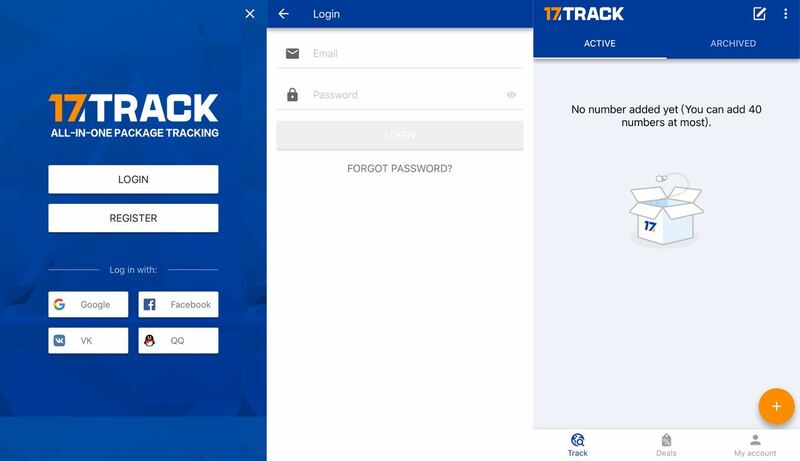 Report a problem：If you ever encounter any usage problem with this app, please click on "Report a problem" to contact us, or you can reach out to us via email serv@17track.net. You will always be heard! Thanks for reviewing this manual. We hope you will enjoy using our app!